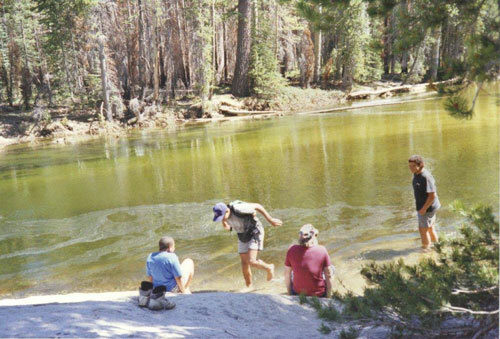 My most successful backpacking trip was from Tuolumne Meadows to Glen Aulin with my two sons, my nephew, my oldest son’s friend, and two of my best friends (the two handsome old guys on the right side of the picture). 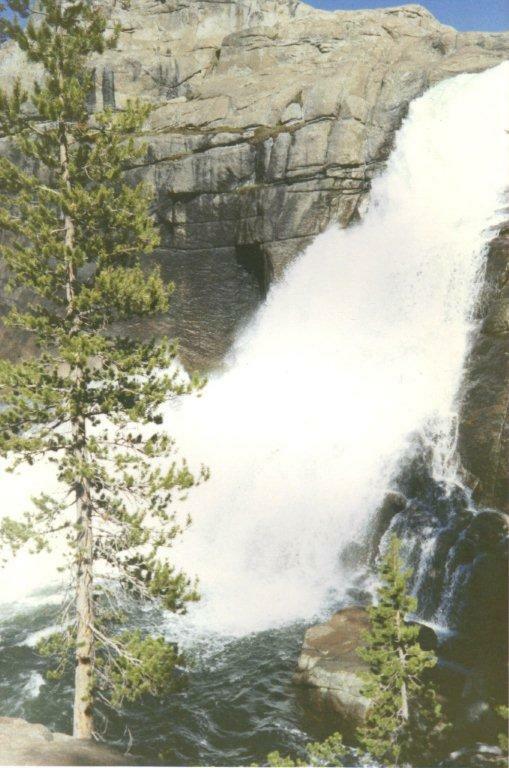 To see all the water falls in the early summer is truly beautiful. The trip is a great getaway from the crowds of Silicon Valley. Yes there are plenty day hikers but only a few over-night backpackers. 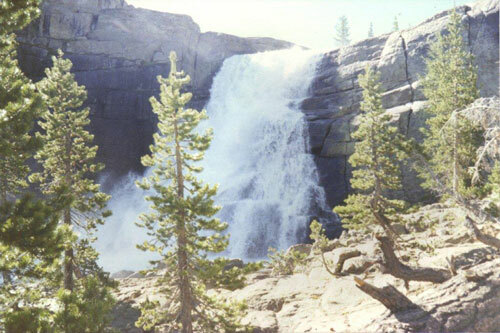 This was over the Father’s Day weekend in 1991 (along with two additional days vacation), I took my two sons, one nephew, a friend of my sons and, two of my best friends on a four day three night backpacking trip in Yosemite National Park. 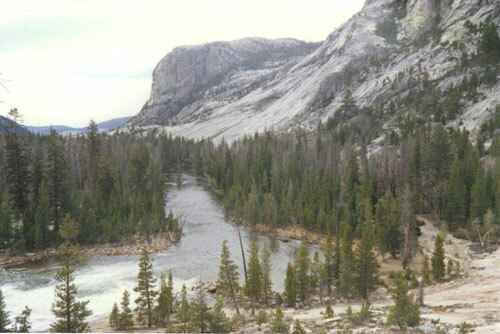 After a four hour drive to Tuolumne Meadows we arrived around 1pm and that night we camped at Tanaya Lake Campgrounds. The second day (the first day on the trail) we backpacked from the Tuolumne Meadows trailhead to Glen Aulin High Sierra Campgrounds. My oldest son and the other teenage boys quickly walked off and left everybody. Shortly after I told my friend to go ahead and I would travel a pace comfortable for my nine year old son. The weather was absolutely beautiful. The temperatures were in the low-sixties, slight wind, and some clouds. No problems with over heating. That was a concern of mine, because I was carrying the things that were too heavy for my youngest son to carry in his little backpack plus the tent. 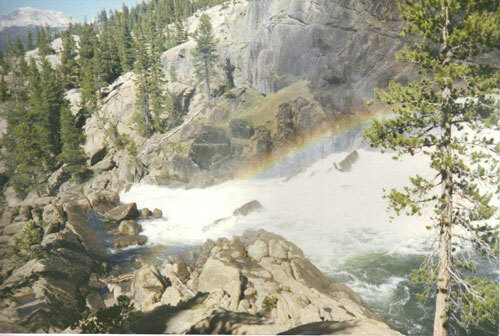 My youngest son was so proud because he was the only child under ten years old who carried his own backpack from Tuolumne Meadows to Glen Aulin. 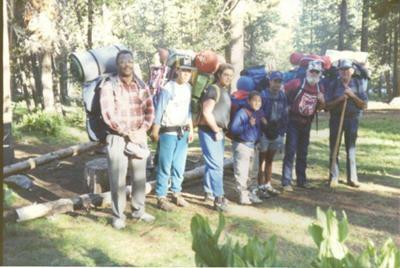 The other young children came into camp that weekend with the fathers carrying the kid’s backpack with the child walking behind their father. 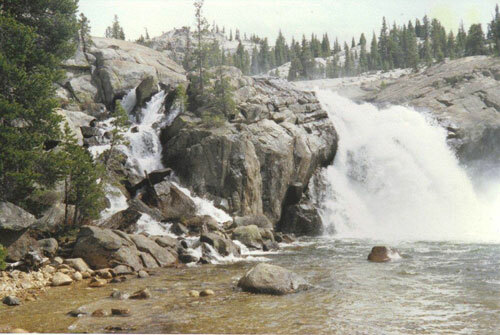 There were some great sights for first time backpackers as you walk through the headwaters of the Tuolumne River. My young son was getting bored by the fourth mile but by the fifth mile he perked up as he saw the sign that indicated we had a little over a mile to go. 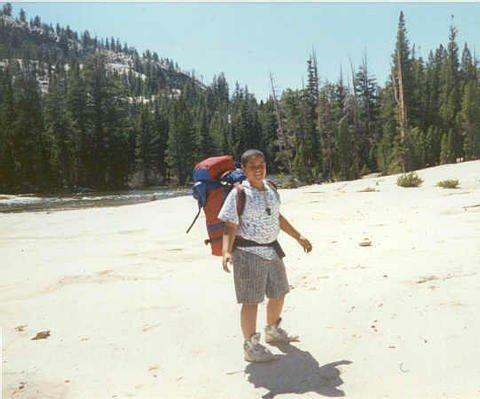 By this time I was getting tired, maybe my fifty-five pound backpack had something to do with my fatigue! We crossed streams walking on top of logs plus one stream where had to take off our shoes and cross bare footed. Overall, a fairly easy and a very scenic trail until the last mile when you encounter the eight hundred foot drop in elevation! 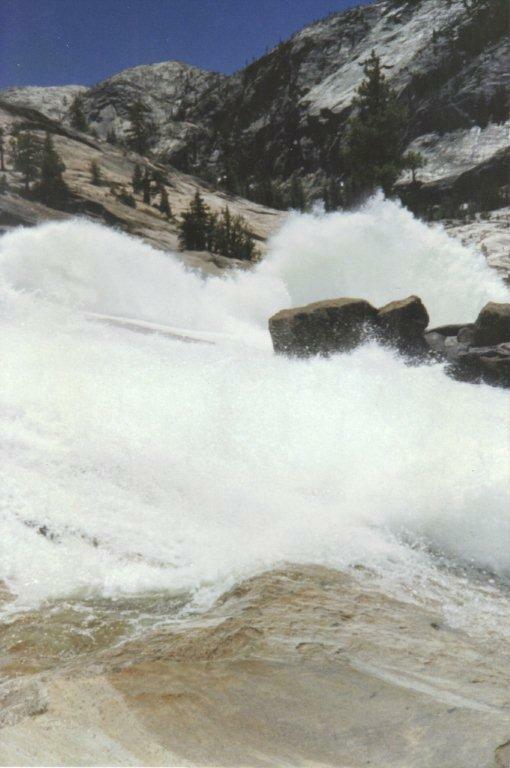 It was during in this last mile the we saw the first of the waterfalls, White Cascade. We got to camp and everybody had wondered if we had encountered some sort of trouble for it took us a lot longer than it did the others. We set up camp and had a nice peaceful dinner and evening. Late that night shortly after mid-night we heard bears running around and about a half hour later we heard some girls screaming! We could tell by the type of screams that they were not being attacked they were trying to scare off the bears, without success. They had decided not to camp in the usual camping area but about a half mile away, by themselves. They made the mistake of not to using the ‘bear trees’ to keep their food away from the bears and place it somewhere around their camp. The next morning as our group was heading down to the three falls, we encountered the four young ladies with their frowns on their faces and with their backpacks on and they were headed home. It was their food that the bears got and their trip was ruined. We offered them food, but they refused saying their hunger would be a good lesson they would not forget backpacking the six and a half miles back Tuolumne Meadows. I would think trying to chase a bear off because it was taking your food, would be a memory you would not forget. We continued our hike down the two miles or so to the series of falls which makes up California Falls, LeConte Falls, and Waterwheel Falls. My favorite was Waterwheel Falls. The turbulence was tremendous and beautiful. On the way down to the falls the boys wanted to stop at a cove and swim. We said no we will stop on our way back to camp. 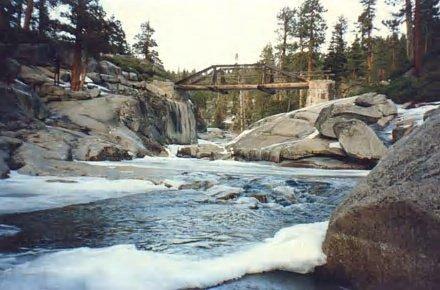 The views from the different falls was truly spectacular, especially Waterwheel Falls. We had lunch there and start back to Glenn Aulin. We reached the cove just below the camp and the boys ran into the river. 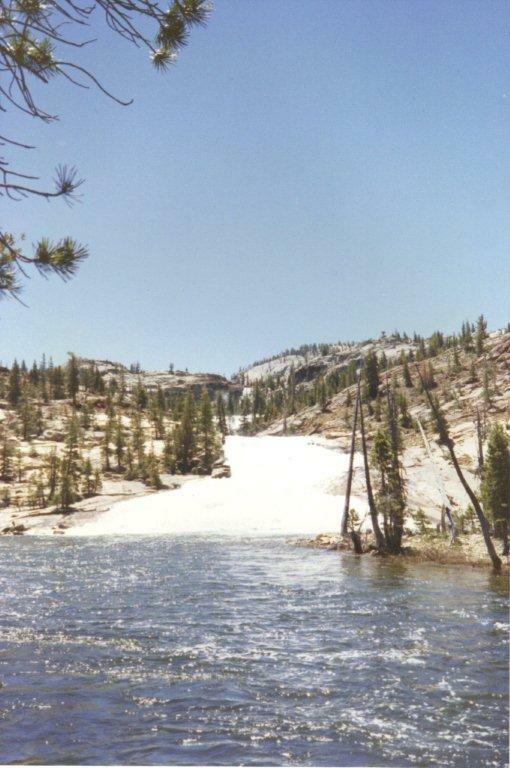 We did not tell the boys many hours ago that water was part of the snow pack! They played in the water for less than five minutes, and the cold water drove them back on land. Us adults all laughed as we walked back to camp. The remainder of the day was uneventful. The third day we went hiking to the north and eventually traveled along the Conness Creek. We found little of great interest there, still it was a nice hike. 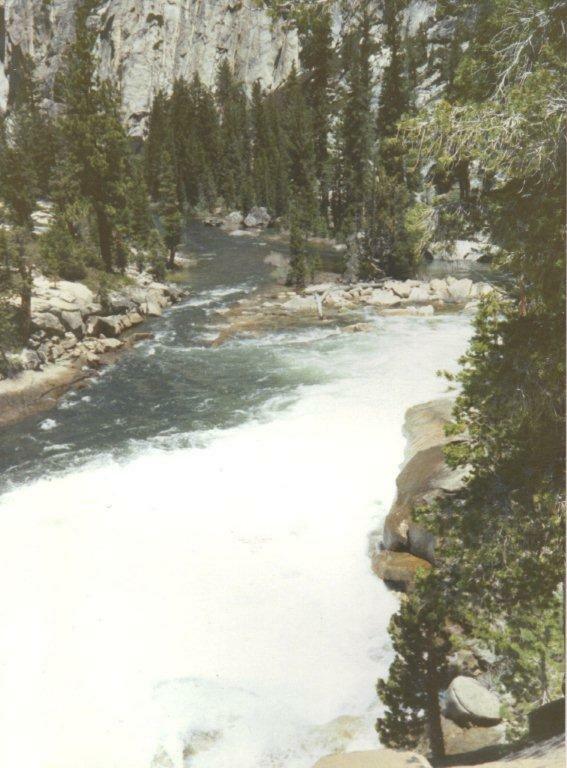 The fourth day we had to leave Glen Aulin heading to Tuolumne Meadows and then home. It provided a lot of warm good memories.